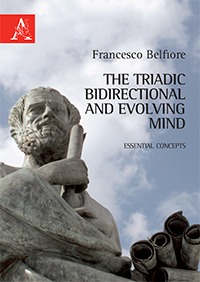 This book presents in a brief, simple and clear form the philosophical conception that was previously published quite extensively in four large volumes. To this end, the author utilizes several schemes and figures that give a visual representation of the various concepts exposed. The title of the book summarizes, in a very brief manner, the content. Mind is triadic, because it is composed of intellect, sensitiveness, and power, which exert the rational, the emotional and the practical activity, respectively, and are of equal rank and interdependent from one another. Mind is bidirectional, because the three activities are exerted both in the outward/selfish and in the inward/moral direction. Mind is evolving, because it continuously evolves by developing the concepts, the emotions and the actions/acts from particular to universal, thereby creating the sciences, the arts, and the society. The evolution of mind is the objective moral good. From this core of thought, new solutions are drawn in the various fields of philosophical inquiry. The result is a short book which, for the richness and variety of its content, will be appreciated by the philosophy scholars.